Stringing beans is one of the things I loathe doing…..i can find the best excuses in the world to not do it…so imagine being married to a bean crazy guy…..K loves his veggies, and amongst them, beans occupy pride of place….I ensure to make an extra half portion when I cook them (eventually) so that I can accommodate his love…..(for the beans I mean) …. Tender French beans you can get away without much stringing, but cluster and gavar beans are the ultimate test of my patience…..
Gavar ki phalli (in pucca hyderabadi) translates to country beans also called mattikayalu in telugu is one of those things that takes you back in time and place….reminds me atleast of my childhood when they were easily available and made atleast twice a month when in season…..its slightly bitterish aftertaste is an acquired one and I have seen only two kinds of relationships people share with gavar beans, they either love it or hate it!! I made it the usual poriyal way, steamed after tempering with minimal spices and a tablespoon or two of fresh grated coconut…all this changed on one of my mother’s stays with us…she puts this coarsely ground masala on it instead of the coconut, and K loved it so much that he requests for it to be made this way ….. The masala is a mix of roasted groundnuts, garlic and jeera….all of which really escalates the flavour….once you string the (damn) beans, the rest is pretty simple to do…. It goes well with rotis and rice…. Heat the oil in a pan and splutter the mustard seeds. Add the onions and fry till translucent ( half a minute). Add the haldi and sauté, add the cut and washed beans, cover with a lid and let it cook for 2-3 minutes. Add salt and continue to cook till almost done. The beans should retain their green colour. In a blender jar, add groundnuts, putnala pappu (if using), pods of garlic, red chilly and coarsely blend for a couple of seconds. The groundnuts should just be crushed and not ground to a fine powder. Add this mixture to the gavar beans and stir for a minute. Take off the heat, serve hot with rotis or rice. I love them cooked any way and you’re not going to believe this, but we had this just like this for lunch today. I am from the love em camp..and these look great! Just one ques, are the groundnuts roasted before using ? 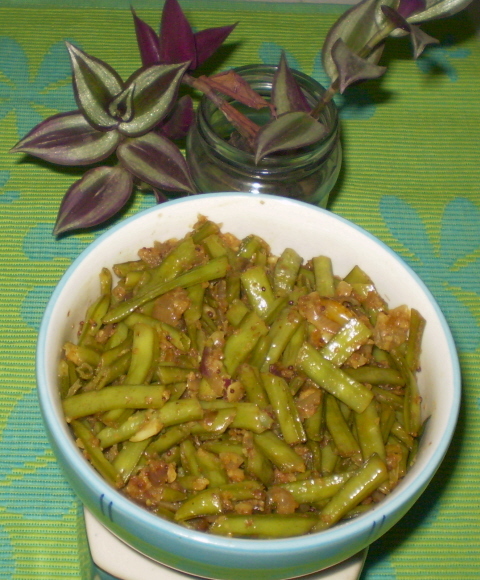 are these cluster beans ,..look delicious,..
never eaten gavar beans – looks delicious! Never heard of this one before but looks very yummy must have tasted really good. gavar beans? wow, never heard of them! This is another new one for me and the dish looks so delicious. I could eat tons of this over hot bowl of white rice! 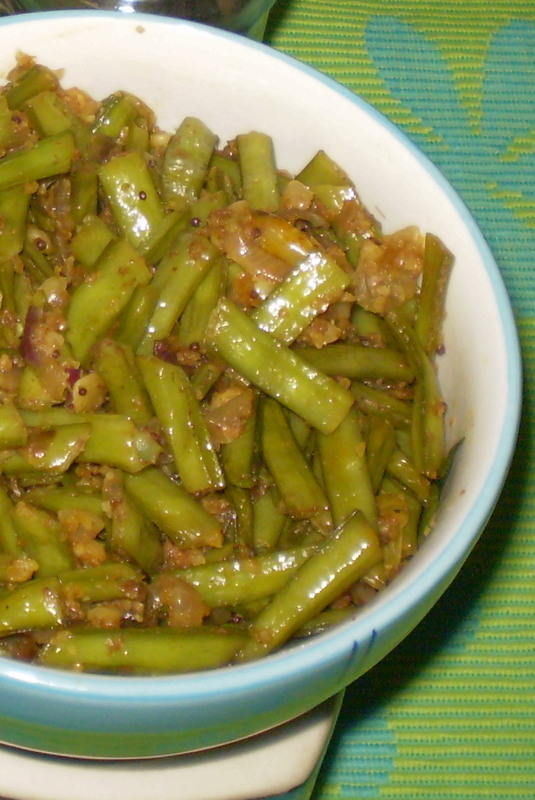 they are called gavar in hindi, cluster beans or guar beans in english…i’ve linked to the info on wikipedia…..they taste fabulous with hot white rice! !